I am so lucky to be a Flying Arts tutor- they fly me places I would never have thought to go, and I meet people and have experiences that I never thought I would. Last week was a week in the Queensland gemfields, west of Emerald, teaching in Sapphire and staying in Rubyvale. Now, doesn't that sound exotic? In fact, Rubyvale and Sapphire are tiny towns, quite low-key and with a highly transient population- lots of tourists come in during winter to try their luck at digging for treasure, but in the hot summer months, the population apparently drops significantly. But there is something about this area that just hooks you in- something deeply satisfying about the possibility of some sparkly destiny waiting for you, maybe just hidden below a thin layer of dust in the main street. 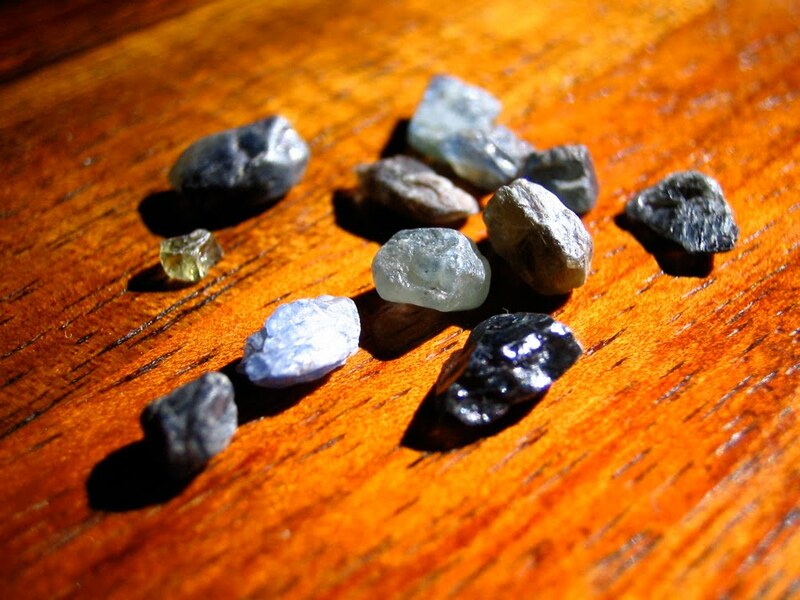 There are lots of good stories that I heard, about lucky tourists who stumble upon some fabulous multi-carat sapphire on their first fossicking trip, or even people who find in their pan a stone already fully faceted and polished- dropped by some unlucky mug in the past. Above is the handful of sapphires that I found. None are large or clear enough to bother cutting (the whole lot would fit on top of a ten cent coin), but I was thrilled nonetheless- couldn't wipe the grin off my face as I sifted through my bucket of dust, in fact. Like a kid. It's never going to come in the pokies. Seriously, we should buy a lease.